1. The most commonly occurring elements in organisms are carbon, hydrogen, oxygen and nitrogen. 2. Sulfur, calcium, phosphorus, iron and sodium are also in organisms in significant amounts. 3. Sulfur is a component of several amino acids. 4. Phosphorus is essential to ATP and nucleic acids. transport chains of respiration and photosynthesis. 7. Calcium is essential to muscle contraction as well as acting as a coenzyme or a messenger. within organisms as most organisms are made of a significant amount of water. water molecules allows water to move as a column of water in the vascular tissues of plants. 10. Water is a polar molecule, and because of this, it is able to dissolve any other polar substance. Because most molecules have polar properties, water is often referred as the universal solvent. substances in the blood of humans. Blood is mostly made up of water. 11. Water is the medium for metabolic reactions. 12. When animals perspire or when plants transpire water is acting as a coolant. and areas where hydrogen bonding would occur. 1. 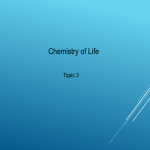 Name the four most common occurring chemical elements in organisms. 2. What chemical element may be deficient if a person shows low levels of energy? 3. What element is found in some amino acids and vitamins? 4. Name two compounds that always contain phosphorus. 5. What causes water to be a polar molecule? universal solvent when in actuality it is not. 8. Explain how water helps to maintain body temperature in humans. 9. How does evaporation from animals and transpiration from plants bring about cooling? 10. Explain the cohesive properties of water. 11. Give an example of water being used as a transport medium in animals. 12. Give an example of water being used as a transport medium in plants.